I regret to inform you that we received notification that as of May 24th, 2013 Linkedin is cutting off HireSignals’ access to the Linkedin API for an apparent violation of their terms of service. As HireSignals relies on this API for highlighting candidates’ job search status while browsing linkedin we have no choice but to suspend the platform in its current form. We started building HireSignals in early 2012 to address what we believed was a serious deficiency in the Linkedin platform – that there was no easy way for candidates to declare job search status and interests and for recruiters to spot those factors so they could time and customize their outreach appropriately. Confidentiality was built into the platform and candidates could easily block their current employers from being able to see their status. At the time of launch (june 2013) HireSignals was fully compliant with Linkedin’s API but in October 2013 we learned that Linkedin did not embrace the platform or the implementation method (browser plugin). We therefore could not reasonably invest in developing our candidate audience without that support as there would always be the threat of them pulling their API support so we have been in slight limbo since then. The API terms and conditions changed over time and Linkedin is now officially pulling the plug on our access to that API. We believe that HireSignals still offers a superior and more confidential job search status declaration solution to anything currently on Linkedin. Linkedin appears to be very focused on a proprietary model where recruiters pay to see the candidates and active candidates pay to be seen. The irony is that the customer experience for the rest of the candidates goes downhill – more poorly targeted and badly timed emails from recruiters armed with a spam engine (which Linkedin’s “Recruiter” product can be in the wrong hands) who can’t see job search status unless the candidate is paying for that to be displayed. But hey, I guess that is progress for a public company! We promise to be back however with a platform that has zero dependence on platforms pursuing a proprietary path liked Linkedin. We will instead focus on where the user (candidate and recruiter) experience is prioritized and services enhancing that experience like HireSignals, are welcome. There are lots of other places where the HireSignals’s model could work – sites like Github as well as browser-accessed ATS and CRM platforms where a personal email address or twitter handle might be exposed so our plugin can recognize the candidate and flag their status and job interests. Those are a few of the areas we want to explore when we retool the platform. User accounts will remain active but all Linkedin related data all be removed. This means that the browser plug-in will no longer work for recruiters on Linkedin. Please email me info@hiresignals.com if you have any questions. Thanks for your support over the past year or so. We look forward to retooling and relaunching soon and welcome your feedback on what platforms we should prioritize. Fred Wilson blogged today about the benefits of the one-click -to0apply function from sites like Indeed and Linkedin. You can read about it here. Fred’s blog is the first thing I read every day and his commentary is great. I am not with him on this though. My recruiting firm, Glenborn, posts our jobs feed automatically to indeed and we receive many resumes from them every day. To say that searching through these inbound applicants for quality candidates is like searching for a needle in a haystack is an understatement. There is no doubt that applying should be that efficient for the right folks but the issue is with stopping the wrong folks from doing it without thinking. Until someone comes up with an answer to dealing with the deluge, the best source of candidates remains (in order of preference) proactively reaching out to the people you know and trust, the referrals from those you trust and finally, cold searching on linkedin based on criteria that you, the recruiter decide matches your requirements. Inbound applicants for my firm has consistently been a case of finding a needle in a haystack- occasionally you get lucky but it isn’t likely. I am delighted to announce that the HireSignals platform is now live and ready to use. The platform allows candidates to declare their job search status and job interests to recruiters on linkedin without compromising their confidentiality. It does this by leveraging a browser plug-in for recruiters that shows that information to them in the form of color coding and pop-up windows. Candidates can block specific domains so that certain recruiters cannot see their status (especially their current employers!). A week ago I attended a Linkedin recruiters event in New York City. We were told that “research shows” that 20% of the folks on Linkedin are actively looking for a position, 20% are not looking for a position and 60% of the pepole on Linkedin could be passive candidates. For recruiters though the issue has always been that you had to guess the status of potential candidates. With HireSignals the goal is to eliminate guesswork, improve recruiter and candidate efficiency alike. Candidates get more targeted emails and don’t get outreach from recruiters when they aren’t interested. Thanks to Rob and Angela on the programming and design side respectively for doing such a great job with getting the site ready for prime-time. Thanks also for your interest in checking out the site/service. Please sign up – remember the point of the platform is that it isn’t just for job seekers – there is potentially as much value in opting in as opting out. 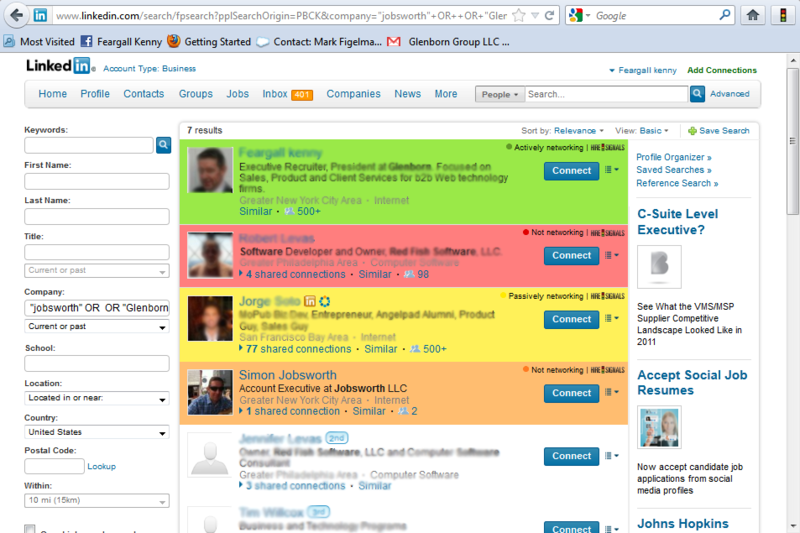 Come back often to check out your actively and change your job search status / interests where appropriate.